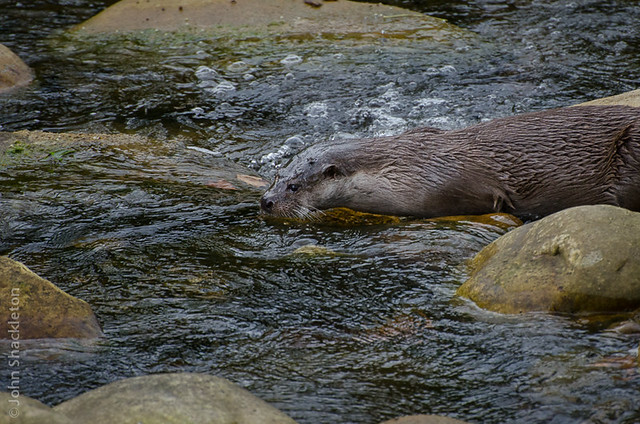 The summer months have proved a frustrating time for watching otters. The river is busy and although we’ve tried several quieter areas, it’s been unsuccessful – no sightings, no tracks, no spraint. However, we’ve been active lately with fantastic mammal observations – including wolves, deer and wild cats. 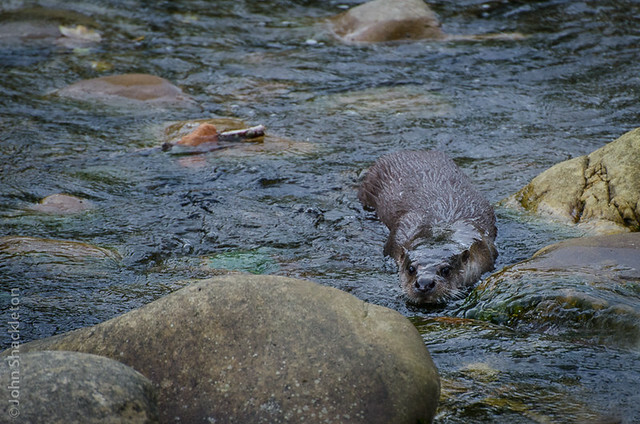 But September is upon us again and time to swap last weeks high mountain excursions and return the river with new places and renewed enthusiasm for watching the otters. 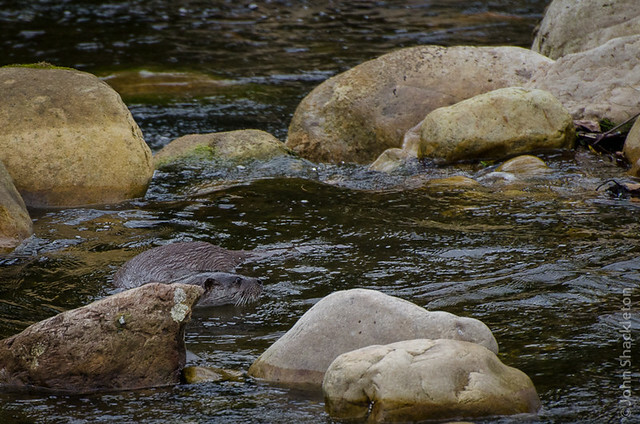 This week we explored a new section of our usual river, a short drive from home. 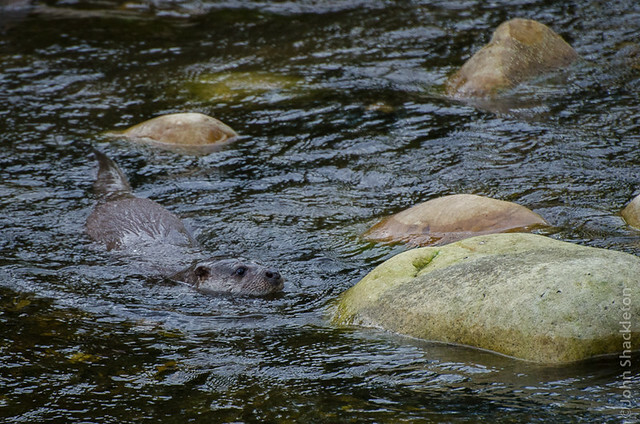 As we walked a 2 kilometre stretch of the river, it dawned upon us this was potentially a great area to watch otters. Quiet but accessible with a low level path, we were excited but kicking ourselves for not discovering it before. 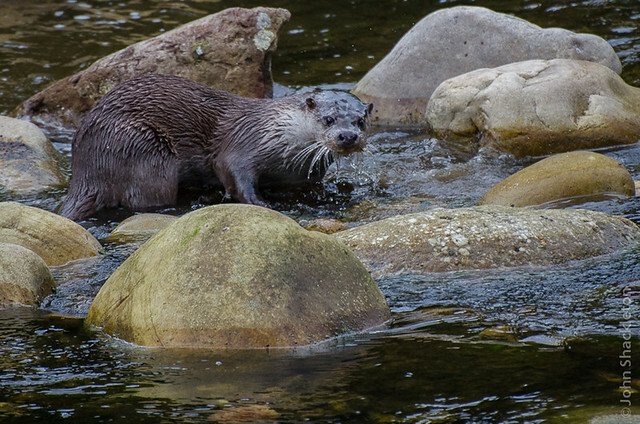 And just 5 minutes after settling on the riverbank – an otter appeared. 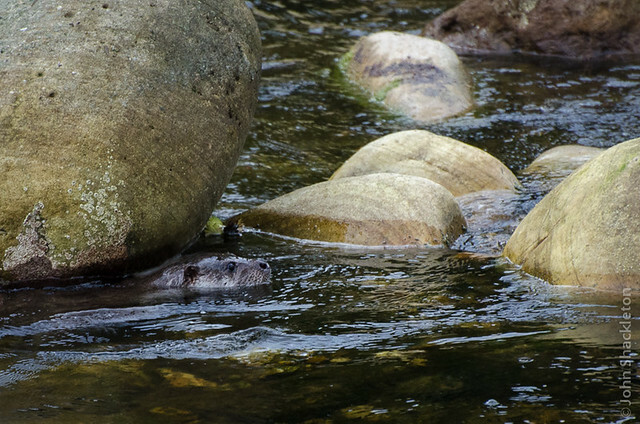 Large and clambering over the rocks, it appeared to be covering every inch of the small pools that were adjacent to the main river course. And it soon caught an eel. 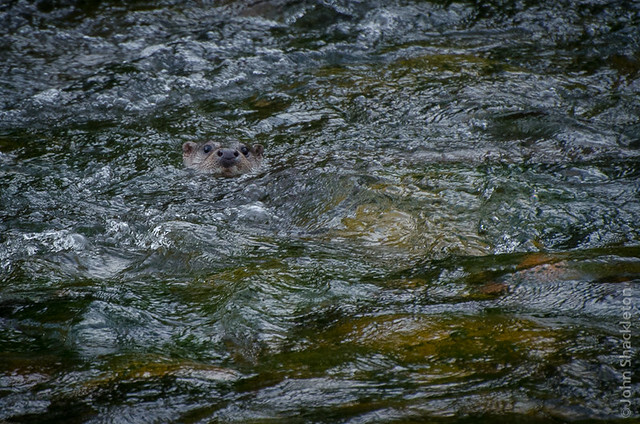 The otter spotted us twice and although it hurriedly swam away, it wasn’t frightened off. It continued hunting and soon returned to the same area to give me another chance with the camera. We enjoyed watching it for 15 minutes before the light faded and we lost it. Hope you enjoy the photos – John. Hi Christine. 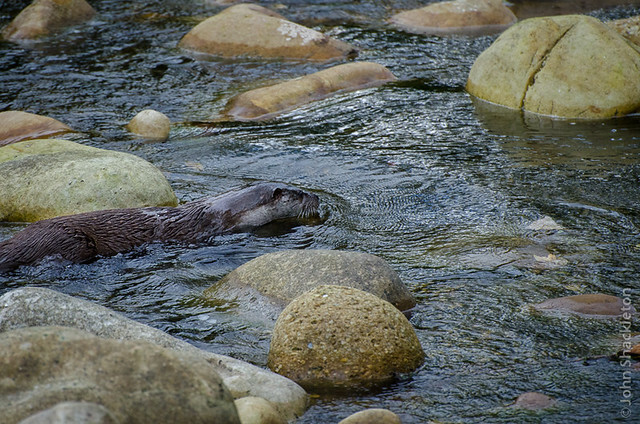 We were close but couldn’t help noticing how big it was in comparison to other otters we’ve watched. The large ears suggest its probably a male, but it’s difficult to be sure. Fine specimen indeed. 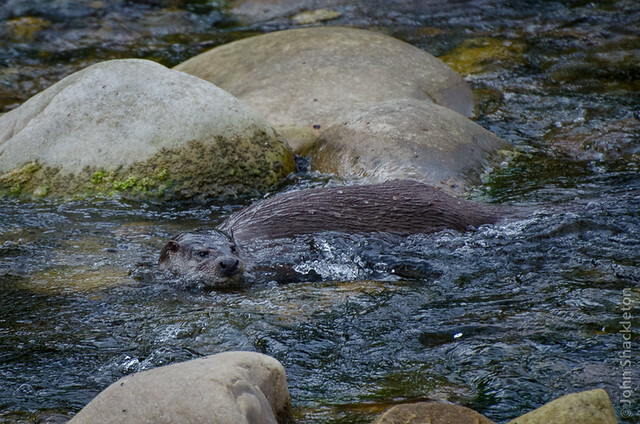 The highlight for me was you turning around and silently screaming “OTTER! !” and then watching you running to the car to fetch the camera. Priceless! Great photos John, I’m glad they are back! 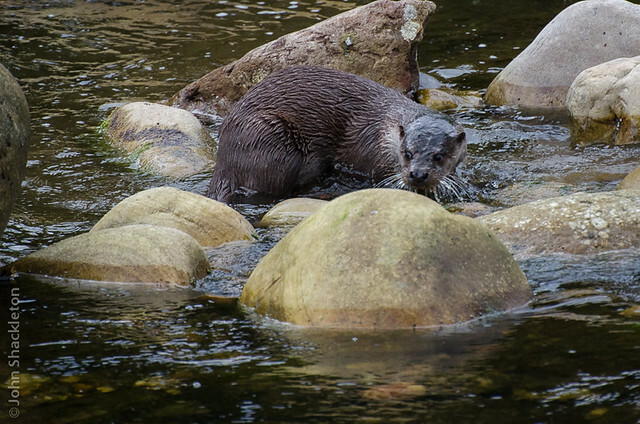 Really lovely photos, and a great blog – love seeing all the amazing wildlife. Thanks Dom. Appreciate the comment. We have plans for more posts soon. Cheers, John.